This church / Community Centre, in partnership with The Salvation Army Willow House Lifehouse (hostel), is operating an Employment Plus Local centre every Tuesday between 1pm and 3pm. Call 0118 958 3019 or email Matthew Stone for more information or to enquiry about volunteer opportunities. 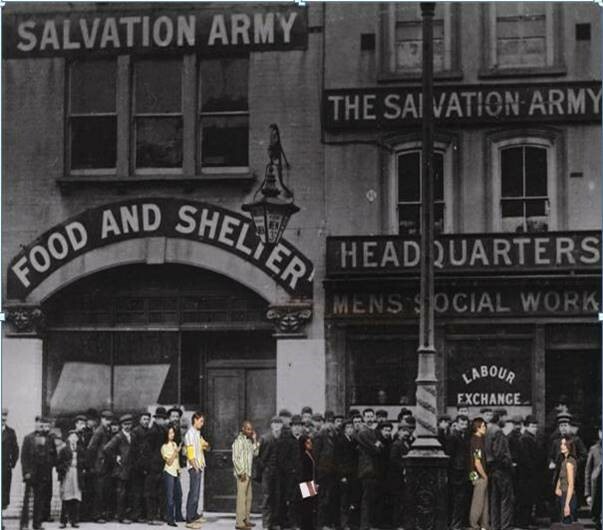 The Salvation Army Labour Exchange first opened 1890 − the good work continues today, represented by the modern day individuals, 129 years later. Employment Plus Local is a local centre where people can find information and guidance on their journey into employment and ability to benefit from the Government′s digital inclusion strategy within a supportive environment. "Work for All" was a cornerstone of William Booth′s social programme. Even today, independent evidence demonstrates that good, worthwhile work is important to physical, mental and spiritual health. The Salvation Army′s belief is that every individual is important to God and helping people to discover self-worth through work not only improves their self-confidence & motivation, but helps contribute to personal, family and community welfare. As a leading provider within the voluntary sector with roots into community and a powerful motivation to work "with heart to God and hand to man", The Salvation Army has an opportunity to provide a bridge between unemployed people and the local labour market. Attending an Employment Plus centre is entirely voluntary and is available to any unemployed person who is looking for work and others who wish to learn new skills. People may attend/join at any time when the Employment plus Local is open. The primary activities at an Employment Plus local centre are to provide back-to-work support and would include: Provision of computers & internet facilities to assist both in job search and to support the government′s digital strategy.